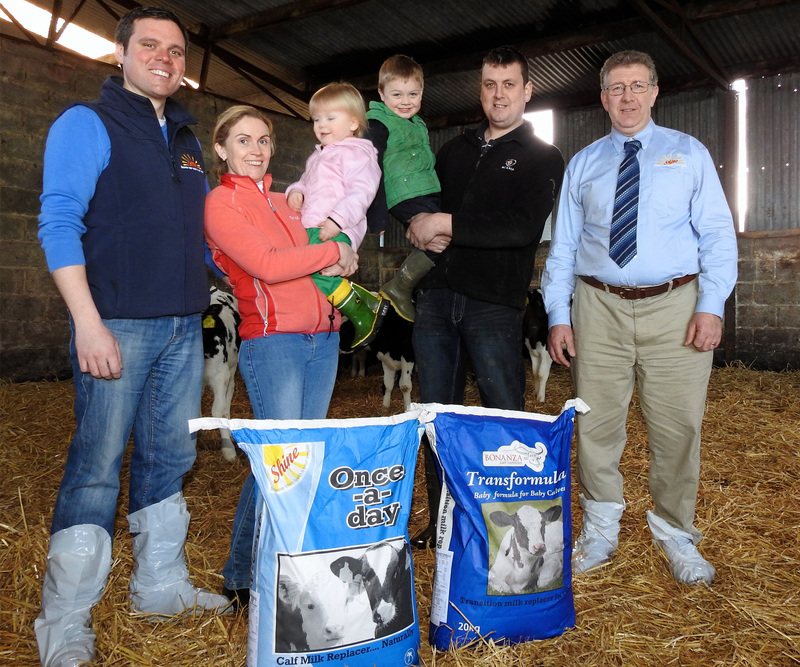 The flexibility of a once-a-day calf feeding system has allowed a Co. Clare agricultural contracting business to expand into calf rearing, increasing numbers year on year to 250. Well known Whitegate, Co Clare Agricultural Contractor Nigel Worrell and his partner, Vanessa, wanted to expand their business activities to generate income on the home farm during quieter periods. Increasing livestock production seemed unfeasible because of the constraints on Nigel’s time during busier periods. But Shine Once-a-Day calf milk replacer made that option possible. “We discussed this with our new local agricultural merchant, Paul Conroy, and he explained how a friend and fellow agricultural merchant, Paddy Fitzgerald from Mayo, had received only positive feedback about Shine Once-a-Day milk replacer from his customers,’’ Nigel recalls. Nigel admits he was initially sceptical because he had previously experienced disappointing results with other milk replacers but decided they would rear 100 calves as a trial in the first year. The results were excellent and differed completely from what they had anticipated. Calves were content within 36 hours of starting on the system and their subsequent performance, especially at weaning, was impressive. There were no mortalities from nutritional upsets. The amount of good quality starter ration the calves consumed was remarkable. Buoyed by the success of that first year, Nigel increased the number of calves they reared, to 250 in 2016. The calves were mainly Friesian bulls but with some Aberdeen Angus and Hereford bulls. He now has an excellent reputation for delivering very healthy and thrifty calves, so much so that many of his clients are repeat buyers. Nigel and Vanessa say the advice they have been given by Paul Conroy, of Conroy Agri Supplies, has been invaluable, providing them with a clear and simple feed plan to help guarantee success. Paul explained how the unique balance of six fats, including butterfat and linseed oil, complemented low heat dried skimmed milk, cultured buttermilk and sweet whey to give a very palatable and easy mixing unique product. Paul stressed from the start that it is imperative every calf gets their allocated milk feed at the same time daily and the system only works with calves having access to clean fresh ration, water and clean fresh straw in a rack daily from the day of arrival. With some dairy farmers keen for Nigel to collect some calves at a younger age, on the recommendation of Paul calves are fed Transformula in the first three days after they arrive on the farm. Transformula is formulated by Bonanza Calf Nutrition to feed stressed calves or to replace natural cow transition milk, which is a necessity on dairy farms where Johne’s disease is present.